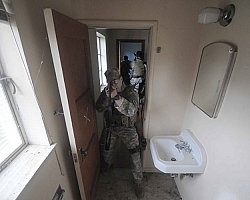 Members of A Company, 1st Battalion, 19th Special Forces Group, Washington Army National Guard, hone their room clearing skills. The dance down the long, dark and cold hallway had begun with a conversation and ended with a show of force. "We're training to perfect close quarters combat (CQC) skills," explained ‘Sgt. West' during an earlier briefing. "Once we've perfected our skills, we will be in a position to train others." After drawing weapons and loading their gear, a number of Soldiers assigned to A Company, 1st Battalion, 19th Special Forces Group (Airborne) left their Buckley-based armory and headed to Rainier School and an abandoned dormitory on the campus. Names and ranks of the Soldiers engaged in the training were not used for security reasons. The building was large, dark and cold. With literally hundreds of rooms, closets, and bathrooms where potential threats could hide, it would also prove to be an ideal training site. The Soldiers carried their gear into the building's foyer and prepared for the day's training. In short order, the team geared up, distributed weapons and adjusted clothing. "Let's walk down this hall and get started," said Sgt. North. Narrow and dark with a worn, dark carpet running down the middle, pools of light spilled from the open room doors on both sides of the hallway. "We'll take it slow and easy, get our steps down and perfect our procedure as we work," said North. Primarily used for surveillance and reconnaissance work in undisclosed areas around the globe, the team is also keeping its direct action (DA) skills sharp as well. "We need to keep all of our skills sharp," said North. "Doing so also allows us to adjust how we conduct operations." The team separated into two smaller teams - one began to train on one side of the building while the other headed to the opposite side of the dormitory. "OK, who's the number one man, the two man?" asked Sgt. Cash. In short order, the Soldiers formed up outside a room door and entered. "Make sure the hallway is locked down," called out North as he watched Cash's operators work. Each room posed a different set of challenges. Some had bathrooms; some had closets; some had connecting walkways to other rooms. Once a room had been cleared, the Soldiers had to safely cross the hallway and enter another room. "This is perfect," said Sgt. Jones moments before entering another room. "Getting in the repetitions is vital to becoming good at this." As the training progressed, the talking about procedures decreased and hand signals and taps to the body took over. West blew out of a room, weapon at the ready as he kept an eye on the hallway. Several other Soldiers crossed the hallway and began clearing the next room. As Jones crossed, his body made contact with West's, who in turn pivoted and entered the room. A word here, a tap there, a pivot here and it began to look like a well-choreographed dance. "It's a dance, alright," said North during a break. "One with lots of guns everywhere."